It is a real pleasure for me to join you today in this very significant celebration to mark the issue of RMB bonds by the Bank of China London branch. Last week, also here at the London Stock Exchange, I witnessed the launch of the joint ETF by CSOP and Source. That was the first ever China A-share fund launched in Europe under the RQFII program. Today, I warmly congratulate Bank of China London Branch on its successful issue of 2.5 billion of RMB denominated bonds. 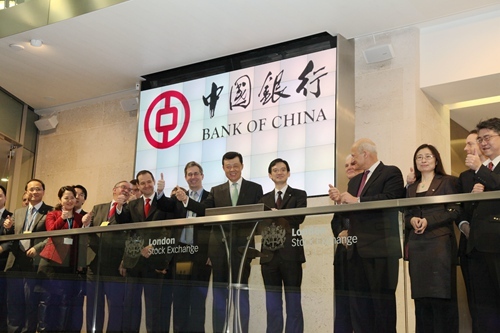 · This is the first time a Chinese bank has issued RMB bonds in London in the capacity of a branch. · These are the first RMB bonds issued by a Chinese bank and listed on the London Stock Exchange. · And this is the largest single issue of RMB bonds in the London market. · This fully demonstrates British and European investors’ recognition of the credit-worthiness of Chinese banks. · It shows China’s active participation and strong support for London’s aspiration to become a centre of off-shore RMB business. 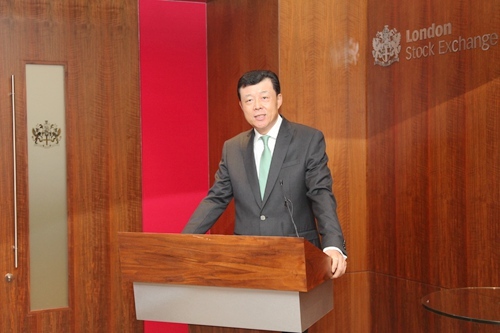 · And it is also an example of deepening China-UK financial cooperation. Right now China’s financial reform is gaining momentum. Reform measures have been introduced ‘thick and fast’. As a result, the RMB is getting increasingly market-based and internationalized. With these trends, I believe London’s status as a centre for off-shore RMB business will be further highlighted and consolidated. China-UK financial cooperation will be even more productive and fruitful. As the Chinese New Year is around the corner, I hope that the Chinese and British financiers and businesses will seize the opportunities to make new breakthroughs and accomplish new achievements in this year of the Horse.